I crossed out the word ‘cocaine’ and considered what I could put in its place. Weed brownies? Cartel members? None of these were words that usually made their way into my book launch vocabulary. I considered looking the author’s parents in the eyes as I gave my speech and settled on ‘cartel members’. Encounters with cartel members could mean anything. Besides, I wasn’t sure that one was allowed to talk about weed brownies in a Waterstones. Luckily, the other parts of my introduction for Amy Baker, the author of Miss-Adventures: A Tale of Ignoring Life Advice While Backpacking Around South America, flowed rather easier. Released in March, this travelogue was part-travelogue, part-disasterlogue, part-tale of finding oneself and an entire joy to publish. I found the upstairs of Horsham Waterstones bustling, once I found it at all – I had printed directions to the shop but decided ignore them, trusting my book-sense to guide the way, which it did with only eventual success. The vivid orange, blue and green book cover flashed between hands as people bought copies or gave them to Amy to sign. After signing her pen dry, Amy stood to say a personal thanks to those who attended and to friends and family who had supported her through her journey. We hope everyone who attended enjoyed the launch. Sometimes the best stories are ones that don’t go exactly as planned – let us know if you’ve had or are planning an adventure abroad. If you want to keep up with all the cool stuff Amy is up to follow her on Twitter and Facebook. Miss-Adventures is available in all good bookshops now and if you enjoy reading it then we’d love for you to leave a review on Amazon. 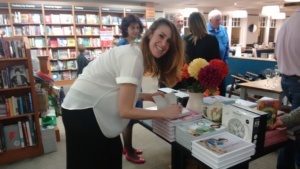 All our thanks to Waterstones Horsham for having us, and to everyone who came to the event.